Please note that it has come to our attention that some of the tables within the gazetteer have been truncated during the scanning proccess and do not accurately reflect the original paper versions. This is in particular relevance to the totals of artefacts from any listed site; in some cases the totals are missing completely but in others the figure has been truncated resulting in an erroneous entry. The Archaeology Data Service and the resource depositor are currently seeking to remedy this situation. The resource is still presented online but please be aware that some tables may contain these errors. This Gazetteer of Mesolithic sites is based on the examination of collections in museum or private possession, published references and any other available source of information. It has been compiled because such a large number of Mesolithic artifacts are unpublished; nowhere is there a reference to their find-spots or present whereabouts. The Gazetteer is thus intended as a guide to the material itself. The sites are listed by civil parishes and boroughs within counties, although it should be noted that recent changes in county administration in England has caused some alterations. The first column in the list of sites is concerned with provenance, the parish being printed in capitals. Beneath is the name or location of the site, if anything is known beyond the parish name itself, followed by the national grid reference to six figures in the next column. This grid reference is qualified by the letters A (accurate), E (estimate) or G (general) to indicate the degree of accuracy by which the provenance is known. The second column is reserved for comments and may give the name of the finder, the date of discovery,whether it is an excavated site or similar information. The majority of finds are surface discoveries, but as this can usually only be assumed, it is not stated unless there should be a special reason. Information cited from writing on the actual artifacts or associated records is given within inverted commas; comments by compilers are in brackets followed by their name or initials. Broad classification of artifacts have been made, not for typological study, but intended to convey an impression of the type of material that has been found. Similarly, quantities of artifacts have sometimes had to be assessed instead of counted, and the prefix c (= circa) is necessary. An asterisk indicates the presence of material in this category but no knowledge of the quantity involved. Published material which has not been traced may often be listed in this way. The final column gives the initials or name of the compiler. It is unavoidable that the Gazetteer may list certain material incorrectly and possibly perpetuate past errors. The typological classification and validity of the material has been assessed by individual compilers and their specialist and local knowledge will have reduced errors to a minimum. It was decided to include the Upper Palaeolithic section at a stage when the Mesolithic survey was nearly complete. This was made possible by the work and agreement of Mr. John Campbell who, at the time, was in the Department of Archaeology at the University of Edinburgh. The majority of the information has been taken from his thesis. 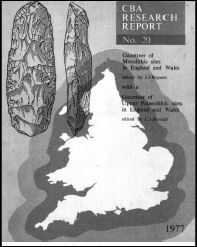 The extraction of information and editing of this gazetteer is almost solely the work of Mr. Clive Bonsall, who was also responsible for much of the Mesolithic gazetteer in the northern counties of England. Where totals are set in parentheses (eg B....5 ), this means that there were at least 5 backed tools from the site. Abbreviations of collaborators and museums are the same as in the Mesolithic gazetteer, and bibliographic references are included in the one bibliography at the end of this volume. Similarly, the sites are contained in the same index. The main difference is that where material from one site is split between two or more museums or private collections, the entries are not separated, and only the total quantity is recorded. Because there is doubt as to the Mesolithic or Upper Palaeolithic date of some of the material, a few sites are unavoidably duplicated in both sections of the gazetteer.